Chalet Nicola is a newly built luxurious chalet. It offers the highest standards of luxury for a truly unforgettable holiday. What better way to appreciate the breathtaking views of the Rhone valley and its snow covered mountains than with a glass of champagne and the warmth of the roaring log fire. This chalet has the most up to date facilities, It has 7 bedrooms with ensuite bathrooms, sauna, hot tub, under floor heating, audio visual features (not only in the lounge, dining room and playroom but also in every bedroom). The Play room with it's own Wii, XBox 360 games console and table football will keep the kids happy while allowing the adults to enjoy the ambience of the Bose sound surround system. Large boot room and double garage. Fully fitted kitchen with American style fridge freezer with ice dispenser, hob, 2 ovens, microwave, 2 dishwashers, coffee machine and a full selection of cooking utensils. Large master bedroom suite with sitting area and balcony. My wife and i have one child and live on the beautiful Island of Jersey, we consider ourselves very lucky to have properties in two beautiful areas of the world. Nendaz is our home from home and we adore it there. We are all ski fanatics and the four valley's is one of the best ski areas in the world. Nendaz in the Summer is equally fantastic. When we first stayed in Nendaz we were amazed at the friendliness of the village. We rent several properties and always aim to give the guests a holiday to remember. We bought a piece of land in Nendaz and built our beautiful chalet to our own specifications, it was completed and ready for our first guests in the winter of 2008. We have made the chalet as luxurious and comfortable as you could wish to ensure a very relaxing and enjoyable holiday. The chalet can sleep 15/16 guests so it is ideal for a multi generation family or several families which makes the chalet extremely good value. It is also ideal for smaller groups who all require their own bedrooms. The location of the chalet is excellent as it is only a few minutes walk from both the ski lift and all the amenities yet it is in a peaceful location. The chalet offers the ultimate in alpine luxury, it is very luxurious and spacious and has loads of little extras to make your holiday one to remember. The views are unbelievable, all the bedrooms are en-suite, we have a Sauna and a hot tub, the most up to date AV equipment, Wifi, luxurious underfloor heating throughout the chalet. We have a fantastic playroom with table football, wii, xbox 360 and a 50 inch plasma TV. We have also a 65 inch plasma in the lounge which is great for watching movies. Just great for keeping the kids entertained in the evening allowing the adults time to relax with a glass of wine in front of the roaring log fire. All bedrooms have ensuite bathrooms. Luxurious fittings. This place is so amazing. The pictures do not do this property justice!! The chalet is so amazing. Stayed there over Christmas 2018 and we loved every moment of it. The view is spectacular and the chalet is huge. Would 100% stay there again! Nicola and Stephen were always so helpful and friendly and quick to respond to any questions we had. Can say enough about this property!! Absolutely brilliant. Could not fault it. The chalet was absolutely fantastic. The chalet has recently been updated with all new AV equipment, New flat panel TV’s in every bedroom. New Bose system. The chalet is very spacious with every amenity that you could possibly need. The playroom is fantastic as is the jacuzzi and sauna. The location is ideal, just a few minutes walk from both the village with shops, bars and restaurants and the ski lifts. Chalet Nicola is a fantastic chalet to stay in! Great views and the chalet has everything you need. We stayed in the chalet with 14 people and never felt crowded at any time because of the size of the chalet. The only thing to keep in mind is the steep walk at the last part to the chalet. Its a nice workout. But the chalet is worth the walk. Would go back to visit the chalet again. Had a great stay at Chalet Nicola, the property could not be faulted and having spoken with Stephen whilst I was there who couldn't have been more accommodating. I would whole heartedly recommend it to any other families looking for large good quality chalet's in Switzerland. I just got back from a 4 day stay at Chalet Nicola with a group of 11 ladies. The chalet was amazing, clean, modern and very well equipt. It was walking distance to shops bars and restaurants, the ice rink etc. The hill walking home at the end of the day was tough but not a problem. The owners were very helpful and answered any enquiry quickly. We all loved our stay at the Chalet and hope to return one day. I celebrated my 30th birthday with friends and couldn't be more pleased with the accommodation, communication with hosts, professionalism and comfort. Plus, it's close to some beautiful hiking trails, which is a great way to mix up the jacuzzi/sauna time with some exercise :) The views from the chalet are absolutely stunning and the pictures match reality. I would recommend this chalet to anyone, who wants to celebrate in style :) Thanks again, Nicola and Stephen! Thank you so much for your kind words. 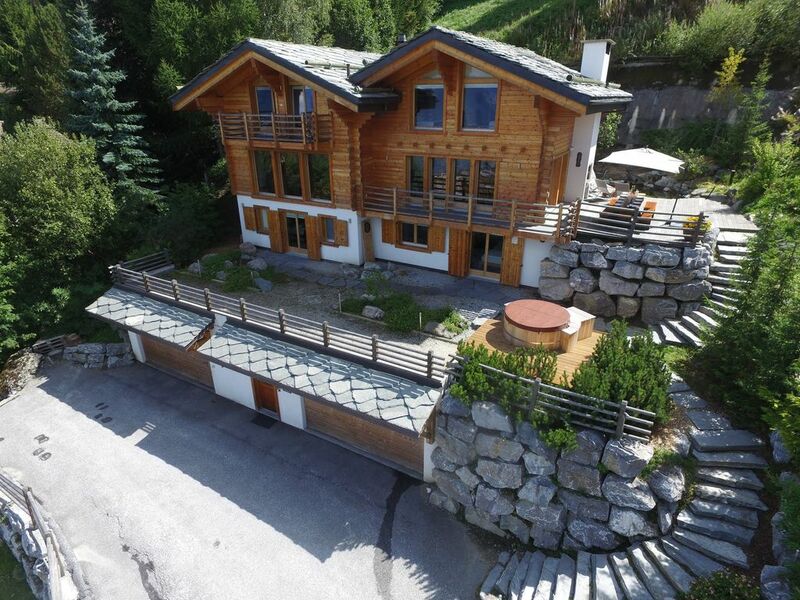 The chalet is indeed in a unique position being close to the village, ski lifts in the winter and fabulous hiking and mountain biking trails in the summer. As you say the sauna and jacuzzi are a great way to relax after a hard day hiking in the mountains. Golf: There are 6 golf courses within 30km of the chalet, the nearest one being Golf Club De Sion which is 15 km away. A friendly and modern holiday resort, Nendaz lies in the ski region neighbouring Verbier, Veysonnaz, La Tsoumaz and Thyon with 412 km of pistes and 92 transport facilities. Also belonging to the Nendaz valley community is Siviez, from where there are cable cars running to Mont Fort, the highest peak of the 4 Valleys ski area. There are also off-piste activities with 12 km of cross-country ski trails, 100 km of winter hiking trails, 2 snowboard parks and 40 km of snowshoe tracks. The Play Room has a bed settee, which can be used as an additional bedroom. A nominal charge charge for bedlinen if this option is used. IF A PERSON OR GROUP OF PEOPLE CANCEL THEIR HOLIDAY AT ANY TIME THEY WILL NOT BE ENTITLED TO THEIR DEPOSIT RETURNED. Cancellation must be made in writing or email and the date of the cancellation will be the date that we receive it and not the date it was sent. If they cancel after they have paid the balance then there will be a proportion of their money returned: a. If they cancel before 8 weeks from the date they are due to arrive in the chalet then they will have their money returned less their deposit b. If they cancel between 4 weeks and 8 weeks of the date they are due to arrive they will lose their deposit + 50% of the balance c.	If they cancel between 2 weeks and 4 weeks they will lose their deposit + 75% of the balance. d.	If they cancel less than 2 weeks then they will lose the whole cost of their holiday and be entitled to no money returned There is a £500 fully returnable breakages deposit for breakages and damages If the chalet is booked for less than 3 nights, a cleaning fee of £300 will apply.